Premise- Two teams of three family members compete in a series of three rounds. In the first round, first will have their chance to ride in the Life Car and drive down a virtual “Game of Life” game board while answering questions. Each team can answer as many questions as possible as long as their Life Car had fuel. A correct answer won the team Life Points and an incorrect answer stopped their for a five second penalty, thus wasting fuel and time. Once a team ran out fuel, the round was over for that team. The second round is played the same as the first except one question in this round earned the team extra fuel and more time and the points were doubled. At the end of the second round, the team who is in the lead played for a bonus prize by spinning the Game of Life spinner. 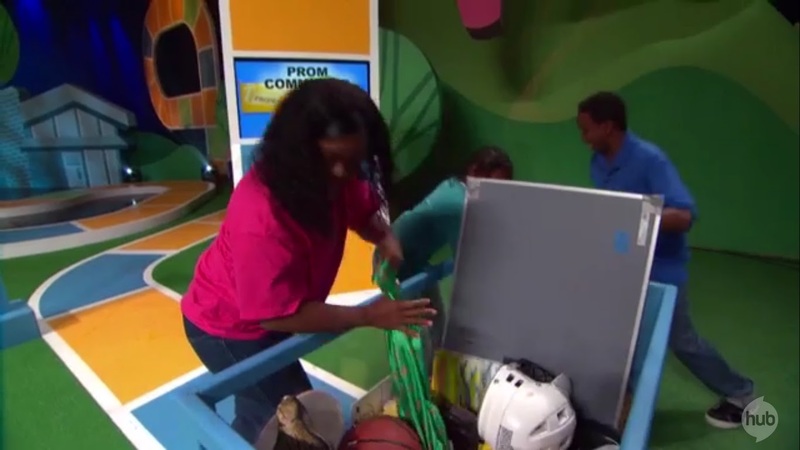 In the third round, the two teams competed in a 60-second physical stunt, where each item was worth 250 Life points. The team with the most points at the end of the third round won the game, a prize, and played in the bonus round. In the bonus round, the team will spin the spinner one final time for a grand prize. Five out the ten spaces will automatically be designated as the grand prize spots. The team can earn up to three more spaces based on how well they know each other. If the team landed on a grand prize space, they won the grand prize. Otherwise, they won a consolation prize. The Game of Life is a decent show to watch for the most part, but there are a few things that the show needs to work on. First, I think the show work better with two teams of four family members, instead of three. Shows that have four immediate family members as a team are more enjoyable to watch such as Family Double Dare and Family Game Night. Second, a live studio audience is needed for this show. I don’t know for sure if The Game of Life has a studio audience or not, but I believe that this show is using an audience/laugh track based on the fact that I didn’t hear a lot of noise or applause from the “audience” while the two teams were competing in the physical stunt round. In any game show where contestants are performing some sort of physical challenge, you will notice that the audience is constantly cheering the players on, even during the last seconds of the stunt. Watch any episode of Double Dare, Think Fast, Finders Keepers, Family Game Night, or Family Challenge and you’ll see what I mean. A show like The Game of Life needs that aspect of a live studio audience. Third, the contestants should wear team uniforms. I wouldn’t have even brought this issue up if it weren’t for the fact that in one of the earlier episode I have seen from the new season. I noticed that the teams were wearing their own clothes until the stunt round, where the teams had to wear The Game of Life t-shirts over their clothing for that round ONLY. 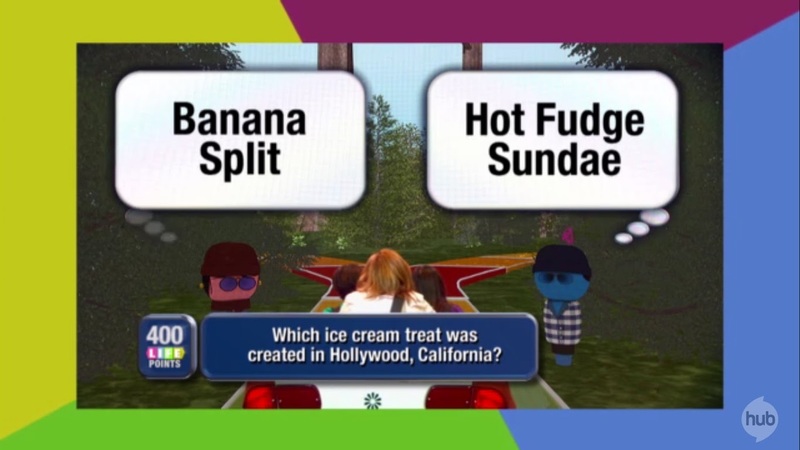 This shows inconsistency in the show’s overall flow and this issue should have been dealt with during the pilot taping of the show, not three episodes later. Even though there are a few things that I don’t like about the show, there are still a lot of things that I do like about the show. I think it goes without saying that the coolest aspects of show are the first two rounds where the teams get to ride in the Life Car. The moving car combined with the green screen technology reminds me of the old Back to the Future ride at Universal Studios in Florida. The kids, even the adults, look like they’re having fun “riding” in the Life Car and going on their short, virtual adventures while answering questions. I like how the animations don’t look cheap, cheesy, and slapped together at the last second. Like in Scrabble Showdown, The Game of Life also have great prizes to give away and the gameplay is also challenging. It may not be as fast-paced as Scrabble Showdown, but the questions are challenging and so are the physical stunts in round three. I find it interesting that the bonus round is as simple as it is and is easier than spinning for the bonus prize after the second round. In my opinion, I would have started the bonus round by letting the winning team choose three free spaces as the grand prize spaces and let the team try to double their chances by earning three more spaces. In terms of the host selection, Frank Nicotero is an excellent host for this show. He has the right amount of energy for The Game of Life, keeps the show flowing at a good pace, and he doesn’t try to turn every little thing into a joke. Overall, The Game of Life is a decent show to watch with an interesting format. There are still a few things that the show needs to work on, such as acquiring a live-studio audience or at least livening up the studio audience if they have one already to bring more life (no pun intended) to the show. The Game of Life did just enough to include a few aspects from the game and to not overcomplicate the game by trying to add every aspect, as in Monopoly. Watch The Game of Life on The Hub! Check The Hub’s TV Schedule for air dates! Next Post International Showdown: Whose Version of "Minute To Win It" Is Better: The U.S. Version or The U.K. Version?